local hero, or an important businessman or politician. $240. That is hardly "pin" money. importance not only to the individual and, by inference, the community and the nation. beginning of a new life for the participants. 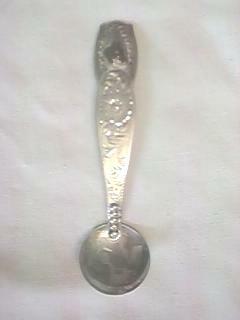 A few spoons were even made for funerals,which we believe were used to symbolize the start of a new life in heaven. For more information on funeral spoons click here. office, a new library, or an important piece of the culture. more valuable and, by inference, made the events depicted much more important. march through town playing their instruments. There would be public and private parties. It was truly a memorable occasion. 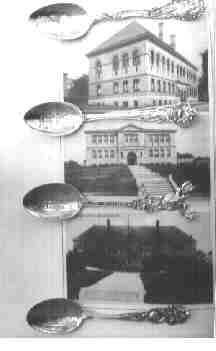 For more information on commemorative courthouse spoons or library spoons. silver objects were consigned to the melting pot. number of fine pieces are available to today's collectors. 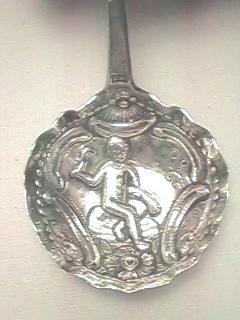 very interesting designs were made into sterling silver spoons. We have both commemorative and souvenir spoons from the same time period. account of the American way of life in fine sterling silver.